Suri sat on a tree branch looking down at the ground with her legs swinging back and froth. itachi appears sitting next to Suri. She looked over to see him. "Oh.hey Itachi.Whats up?" "nothing much, just looking for someone to talk to." "Feeling lonely today? "Suri said giving him a sad look. "Yes, thats why i came looking for you." She smiles. "I feel so loved." "Yes, you are but, your are also friendly." Suri gives Itachi a hug. "Thank you." "your Welcome." stuill hugging her. "Your so kind and friendly yourself. "Suri smiles still hugging. "Its true. "Suri pulls back from the hug and smiles at him. "i know. you are to." Suri's smile widens. "Hehe thank you." "now what do you want to do?" "I don't know...Wanna play truth or dare?" Suri blushes a bit. "Do you think im pretty?" 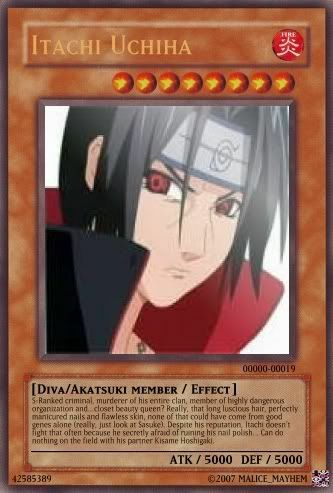 In embaressment itachi says. "yes." Suri smiles. "Hehe good cuz if you said no i would of killed you. "She giggles. iotachi still in embaressement. "ok."